For other uses, see Thumbelina (disambiguation). 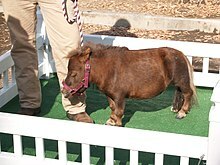 Thumbelina (born May 1, 2001) is a dwarf miniature horse and the world's smallest horse. She stands 43 centimetres (17 in) tall and weighs 26 kilograms (57 lb), and received the title of world's smallest from Guinness World Records. Thumbelina was born in St. Louis, Missouri. Her owners, Paul and Kay Goessling, and her handler, Michael Goessling, care for her along with other miniature horses on their farm in Ladue. Black Beauty, the previous horse often recognized as the smallest. ^ "Thumbelina Fun Facts". Goose Creek Farms, Inc. Retrieved 2010-12-14. ^ Douglas, Jeff (2007-03-19). "World's smallest horse has tall order". The Washington Post. Associated Press. Retrieved 2017-03-14. ^ Linn. "The world's smallest horse". Clipets. Archived from the original on 2012-10-30. Retrieved 2006-11-28. This page was last edited on 15 October 2018, at 00:47 (UTC).